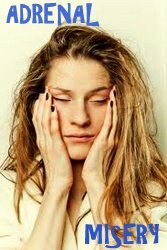 Home » Janie’s Blog » Why do some patients escape adrenal dysfunction?? I think I know why I did. Anyone who has read my story of nearly 20 years of absolute misery on T4-only meds would think I’d be right in the thick of adrenal fatigue / HPA dysfunction and low cortisol. Those were horrible, miserable, stressful, debilitating years. For awhile after I entered the thyroid patient activist field, I felt guilty. That was especially true as I saw how terribly people suffer with low cortisol. But I also realized there was something potentially amazing to be discovered as to WHY I escaped it. But years went by, and I have always been extremely busy as an activist: daily emails to take care of; constant updates to the website, keeping track of Yahoo and Facebook groups; thinking about and writing the blog; activities around the book, phone consultations, and so much more. I have also fought to have an important private life. So, it wasn’t until recently that I readdressed this question: why did I escape adrenal dysfunction? Was it genes which gave me strong adrenals?? That thought has drifted through my mind many times. But I wasn’t sure. So recently, I took some time to really search my past to find answers. And something else really stood out. There is much more on the net than the above, as well. And in fact, the important relationship between Vitamin C and your adrenals was proposed in 1951. This was huge, to me, as to why I may have escaped adrenal dysfunction. Even the use of B-vitamins and magnesium are important, tho I don’t remember what I was taking of those. ANOTHER CLUE: I had a conversation with a gal recently. Like me, she suffered a long time, yet did not fall into adrenal fatique. I asked her why she felt she escaped it. She explained that she had worked for a naturopath for many years, and thus, took many supplements, including high dose Vitamin C. I was dumbfounded. MY CONCLUSION: Whether I have found the irrefutable reason as to why I didn’t fall into adrenal fatigue and low cortisol may not be answered inconclusively. And who knows if some of us just have genetically strong adrenals. But I lean to believe that my early use of high-dose Vitamin C all those miserable years may have been a huge factor, along with B-vitamins which can also be depleted. Today, I take a minimum of 2350 mg daily via my buffered C powder, and in water, and usually double that amount, as I like taking it before bedtime for the magnesium. I am also a fanatic about adding squeezed lemon to my water or occasional fluoride-laden iced tea. Have you heard of Scurvy? This is a progressive disease from the deficiency of vitamin C that ultimately leads to death. And Linus Pauling wrote in his 1979 book, Biomolecular Sciences, that death from Scurvy is actually “adrenalcortical failure”. That is profound as to the importance of Vitamin C with YOUR adrenal health and/or recovery. What about you? If you escaped adrenal dysfunction while going through years of misery on T4-only meds, or being held hostage to the lousy TSH lab result, why do YOU think you escaped it? * IODINE: Finally, I have updated the iodine page on STTM–long overdue. Thanks to VRP for pointing out that their links have changed. You can read many different links about iodine, the controversies and more, and decide for yourself what is right for you. * FINDING A BETTER DOCTOR: Want to try to find a better doc that the vast majority of cows…oops, doctors? Go here. * TALK TO OTHERS: Talking to other patients is what started me on new path years ago. You can too, here. Scroll down to view them all. Perhaps I missed it but in cases where vitamin c helps with low adrenal function, what is going on that causes the adrenals to need more than the average person obtains through diet? I’m glad to have a solution that works but I would ultimately like to not have to take it. Thanks! Do know that I was only guessing about Vitamin C. I also think my genetics could have also been the reason I never got low cortisol—I tend to run on high adrenaline. Hi Janie – I came across the liposomal vitamin c thing awhile back – I have been taking it 3-4 times a day this week, and I’ve been having anxiety/panic attacks when I don’t usually. I have hashi’s, and I’m trying to get my adrenals in a better state to be able to try taking iodine. Anyway- I wasn’t sure what was suddenly causing more fatigue and especially these anxiety attacks, and i found this excerpt on Dr. Lam’s site: http://www.drlam.com/articles/Vitamin_C_Safety.asp: Those with adrenal fatigue, especially in the advance stage, may experience increased anxiety and or fatigue with vitamin C. This is generally due to a clearance problem and not the vitamin C itself. Vitamin C is broken down into metabolites prior to its excretion from the body. If this breakdown process is dysfunctional or functionally sub-optimally ( as frequently seen in advance adrenal weakness), the speed of clearance is reduced. As a result, metabolites accumulate and circulate in the body for a longer period of time. This excessive circulating metabolite can trigger a wide variety of “re-toxification” like symptoms including malaise, joint pain, anxiety, fatigue, heart palpitations, etc. These are not side effects of vitamin C. – If this is what is happening to me, I am trying to figure out how I go about addressing this. Just curious if you know anything about this. I believe I have lyme too which complicates things, but nevertheless, I really want to take this vitamin c but strange how the adrenals have a hard time handling it or something even though that’s what they need? Razel, I have the same problem of anxiety when taking 4+ grams of Liposomal V C, I have had manic episodes in the past so I wonder what the VC is affecting? Gland or possibly something in the brain? Lower doses I feel just fine. I agree with you, Jane. My dad was a vitamin proponent and had all us kids on them every day. It was such a habit that I continued it throughout my whole life. Because of allergies and sinus problems, I increased my Vit C since I was in my 20’s. I’m 70 now. It’s been a mystery to me to read the testimonies of all the hypothyroid sufferers, that I didn’t have nearly the anguish and pain that the others did. I have my share of symptoms, particularly excess mucin, but not the devastating effects so many have experienced. I was able to function pretty well and only had an escalation of symptoms after I retired at 68. Am on ndt now and approaching optimal dosing; and feeling pretty good. I guess I should thank my Dad for putting us all on vitamins…. Although not directly on topic, I�m trying to get word out about a new process to make significantly higher potency liposomal vitamin C. I�m selling nothing (there are not even ads on the site), I simply want to help people make better liposomal vitamin C.
Have you ever tried using rosehips powder for the vitamin c source? Would there be any advantage/disadvantage? Also, Carolyn Dean has a “how to” on this process. If we just do that and don’t follow your process so scientifically, will we get something encapsulated out of it?? Do not forget another cause of thyroid and adrenal dysfunction is the new toxin prevalent in everyone’s environment. Remove all wireless devices from your environment, especially cordless landlines (the base transmits 24/7 whether or not you’re on a call resulting in the same intensity of radiation inside your home as if you were in the main beam of a cell phone tower) and WiFI. Cable up and keep safe. Dr Mercola has written about it. Very interesting, thanks for posting. I was supplementing vitamin/minerals for about 5 years before being dx with hashimoto’s. I was already dealing with t2 diabetes and rheumatoid arthritis when hashis came along, so thought it was a natural progression of my general immune dysfunction, and I have been successfully treating it with t4 only (synthroid) since. Now, however, I believe that my increased dietary soy intake contributed heavily to my hashis dx. Allergies plagued me for years, taking daily meds year round, and last year I realized I was allergic to soy in addition to my existing pollen, peanuts, egg and penicillin allergies. Although I “eliminated” soy from my diet soon after hashis dx I didn’t realize I was still eating soy in many packaged food items that I continued to eat. After I noticed my morning whey protein contained soy lecithin, I checked labels and cleaned up my diet even further; soy lecithin is in many packaged food items. The egg allergy still bothered me, and I wondered why that was. In my search for an answer, I found out most chickens in the USA are fed diets high in soy, corn and other grains, and that eggs from these chickens also contain high amounts of soy. Since last summer, I have been buying pasture raised, antibiotic-free, grain-free meats, wild caught fish, and organic fruits and veggies as much as possible. I haven’t found a local source for soy-free poultry, so I don’t eat it very often. Even the “organically raised” chickens are supplemented with feed containing soy. A word of warning, when I eliminated every last trace of soy from my diet, which was daily intake, but not what I thought to be a considerable amount, it started me on a thyroid high that lasted several weeks. It took the better part of a year to get my dosage adjusted properly again. In my opinion, the food supply in the USA is suspect. I’m just throwing this out there as another possibility. Buy local and ask questions about how the food you eat (animal and vegetable) was raised. Watch Food, Inc. and read about the Paleo / Primal diets. Please Read “my health story” on my blog http://www.serendipitoushome.blogspot.com. I could not successfully switch from synthetic thyroid hormone to naturual thyroid hormone until my adrenals were supported and needed hydrocortisone to do that. Being hypothyroid for many years prevented my body from detoxing and as a result to this day I still need to detox. Not everyone on HC support can detox though as it stresses our adrenals too much and could cause us to crash. My diet is rotational gluten, white sugar, dairy, corn free and all home made whole foods and after 5 years of this MY hormones are still not all in line from all the correct changes. Bill, pease don’t put out general statements that make those who have tried everything and are still suffering feel like it is their faults, that they are not doing the right things, sometimes those right things are just not enough when your health has deteriorated so badly. Now I, like Janie was a fitness buff and a bodybuilder but Vit C I did not take regular Vit C and suffered adrenal fatigue greatly. I do take 2000 – 4000 daily now though and notice a huge difference in my immune system without it. I take Vit C that is in a clear gel cap which I absorb better than the hard tab’s. Superb article Janie and I’m going to share this with my entire family! I looked into Liposomal C, but when I discovered it involved nanotechnology, I didn’t buy any. I avoid nanotech products out of fear because we really don’t know the side effects yet. I have even avoided microfiber towels, not knowing if that is nanotech or not. I think it is. Might nanotech microfibers be a cause of Morgellon’s disease, where people are finding fibers growing under their skin? Haven’t heard of microfiber towels as a cause, but it seems logical to me. I believe Morgellon�s disease is caused by chemwebs and not nanotech microfibers…. For those that are saying you took 1500-2000mg a day of Vit C, you’re really not taking 1500-2000. You took maybe 380mg since regular C is very minimally absorbed (about 19%). I wonder what 3000-5000 of “real” C would’ve done for some of us? I do not sell vitamins or anything else, good heavens. I’m just trying to help. Janie wouldn’t have posted my responses and let anyone advertise, if she didn’t know who I was. Let’s not be so distrusting and instead do some of the research that I suggested. You might be amazed at what you find out about Liposomol C. I wonder how many people checked it out. Ditto DC. Took 1000-1500mg (breakfast, lunch and dinner) per day since I was 15. Still got majorly depressed adrenals. Stopped last year and noticed no real difference, to be honest. Is the person identified as “me” selling supplements? I hope not. Janie what brands of Vitamin C do you recommend? And what other types of supplements support the adrenals? Thank you! Or you can get 90 serving at the site I mentioned above. Just goes to show everyone is different. I have taken high doses of Vit C since I was a teenager. (plus other supplements) After 20 years of crappy T4 only meds I still had very low adrenal function. Wow – this is amazing! I wondered why it seemed I didn’t have adrenal fatigue… why I would only have low thyroid – my cortisol test came back fine. I take a LOT of vitamin C! Ever since I was a teen I’ve taken a 2,000-5,000 mg of vitamin C daily, and this last year I’ve been taking Lipo-Spheric Vitamin C – it has an almost 100% absorbency rate instead of around 20% of regular oral vitamin C. I used to get so many colds every winter (and didn’t know I was hypo) and then I started using Lipo-Spheric Vitamin C from Live On Labs this past year, and this past Winter I haven’t had not even one single cold!!! So perhaps that’s why I haven’t had adrenal fatigue as well. Also, when we were young, us children could never contract Chicken Pox, though we tried and tried…. at 25 years old, my sister finally got them, and she never did get them very bad like you usually would at that age. We think we tracked it back to her taking such large doses of vitamin C!!! Thanks for your helpful insight, Janie! Janie – this is really good information and was so excited to read this. I am now upping my intake of Vit C.
I wanted to let you know about another piece of this puzzle I have recently come across. I too have been wondering why I got adrenal fatigue so bad when I have only been mistreated for 8 years and others like you much longer. With the help of another member on one of these forums who pointed me in this direction, I did some deeper research on my antidepressant. Seems that lots of hypo people who suffered from inadequate thyroid treatment also suffered depression of some sort. Mine was so bad that I was on multiple antidepressants at one time. What I found out in my research is how antidepressants work. They work by raising your cortisol levels. And they are only intended to be on short-term. I was on these for 8 years!!! They excavated my adrenal glands!! I had felt several years back that they had lost their effectiveness, but my dr. decided just to try another antidepressant which sent me into a manic episode and I have never been bi-polar. She switched me back to my old medication which I kept taking. Well, after reading your book, I was convinced I didn’t have depression – I had a depressed thyroid! So over the course of 4 months I came off all my antidepressant medication and guess what!?!? While it was still hard to get off even and 2.5 mg, I never noticed a change in my mood. So good ridden expensive, ineffective medicine! But I do think this IS another piece of the adrenal fatigue factor. Weston A. Price in his book Physical Degeneration sites instances where indigenous peoples (American Indians, I believe) would eat the adrenal glands of the animals they hunted. They did this for the vitamin C content of glands. It was considered a sacred food. They would give a small piece of the gland to each member of the family. This kept them free of disease from lack of vitamin C in areas where foods rich in vitamin C were not available certain times of the year. Excellent newsletter Janie. I think you are so right on this topic. You may want to have your readers check into Liposomol Vit C. It’s supposed to be 93% absorbable as opposed to 19% for regular C. Liposomal is as close to IV Vit C that you can get. Since IV C is getting harder and harder to get this is the next best thing. I have no connection to this site but it might be a good place to start researching Liposomal Vit C.
Everything you said is precisely accurate, Linda; Native Americans did consume the adrenal glands of animals they hunted. Only the tribes up north, though, as they were the only ones deprived of vitamin C in the winter.